This festival, also known as Oimelc, marks the beginning of the earth’s awakening after the cold and darkness of winter. Some sources say the word means ‘ewe’s milk’ and some ‘in the belly’. This is the time when female sheep begin to lactate, and is the start of the lambing season. But it’s also the time when life begins to grow in the womb of the earth, so both meanings of Imbolc make sense. The festival is a Celtic Cross Quarter day, and marked the time in the old farming calendar when ploughing began. The corn dollies saved at Lammas, believed to hold the spirit of the corn, were either burned and their ashes ploughed back into the earth, or ploughed directly into the soil. 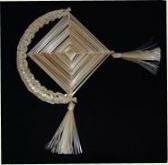 This symbolised the return of the corn spirit to the earth, thus ensuring fertility for the year ahead. 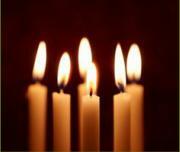 Imbolc is the festival of the Goddess in her Maiden aspect. The crescent moon and white candles are symbols depicting the strength and purity of the virgin goddess who brings new life to the earth. She has many names – notably Brigid or Bride, which are apparently the origin of the word ‘bride’. The custom of the bride wearing white and carrying flowers at her wedding are said to come from this pagan goddess. Brigid or Bride was later Christianised as St. Bridget, but her origins go back much further. She is also the goddess of sacred wells and springs. 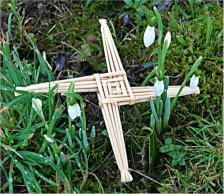 The Brigid’s Cross , an important Imbolc symbol, is woven with four arms. Both of the beautiful corn dollies pictured here were made by Gillian Nott of the Guild of Straw Craftsmen; the one below seems to be particularly perfect for Imbolc as it also features a crescent moon. Folklore tells of the Maiden crossing the threshold at Imbolc, which makes this a liminal festival – a sacred time when the door between the worlds is open. It’s also a time to clean and get rid of the old season’s clutter, both in the home and one’s life. 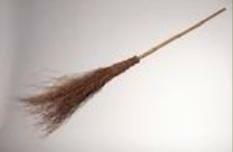 The besom (old fashioned broom) is therefore also a symbol of Imbolc, and is often placed at the threshold. Christianity subsumed this ancient festival and renamed it Candlemas, echoing the white candle theme, and marking it as the purification of the Virgin Mary. The links here with the pagan goddess and Bride are very obvious. This is also the festival of the Maiden Huntress, the powerful young woman who uses the crescent moon as her bow. To celebrate Imbolc, light white candles in your home, have a good clearout, plant bulbs or seeds and remember this is the time of celebration of the strength and power of young womanhood – Brigit, Isis, Diana, Artemis, call her what you will. At Stonewylde, a young girl is chosen to be the Bright Maiden who wears white, with a headdress of silver wicker interlaced with snowdrops and a crescent moon. A young man is chosen especially for his prowess with the longbow to be the Archer of Imbolc, her partner. Some believe that Robin Hood and Maid Marion are actually derived from old folklore and the young couple who symbolised Imbolc. Even though this festival can appear to be in the middle of winter when the weather is at its most bitter, nevertheless there are often many signs around this time of the beginning of life stirring in the cold earth. The Goddess is never dead – ?only sleeping ?- and Imbolc marks her first awakenings.